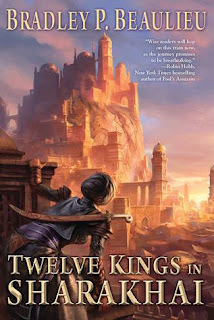 Being a late-comer to the Lays of Anuskaya (the trilogy is still on my TBR list), Twelve Kings in Sharakhai serves as my first real introduction to the work of Bradley P. Beaulieu - and I was not disappointed. Initially, I was a bit hesitant about the book, based not on Beaulieu's reputation, but on the book's setting. I'm a traditionalist at heart, with a love for the sprawling forests and towering mountains of epic fantasy, so the recent trend towards desert fantasy has presented something of a challenge. Fortunately, Beaulieu knows precisely what to do with that setting, and exactly how to develop it. The world-building here is quite remarkable - beginning with the sand-locked ports. Yes, he has developed an entire system of sand-sailing ships that skim across the desert, tacking against the wind, and riding out the storms. He pockets the desert with magical oases, populates them trees and flowers that have almost magical herbal properties, and protects them with a mysterious monster known as the asir. As for Sharakhai, it is a proper city, complete with slums, bazaars, royal gardens, fighting pits, and even hilltop castles. It's a setting that's entirely new, but which still feels familiar. In terms of culture, politics, and mythology, the world-building is equally remarkable. It takes a while for those aspects to really develop, but the mystery of the Twelve Kings and their monstrous asir carries much of the story, and I quite liked the slow reveal of the humanity beneath the legends. World-building aside, this is Çeda's story - and she is one of the most intriguing protagonists to cross the page in years. We first meet her as a masked fighter in the pits, before following her home to a life of feigned age and weakness in the slums. She's a study in contrasts, playing up (or down) her strengths and weaknesses as the situation dictates. Weighed down by a tragic past and a difficult life, she lives to avenge her mother's death and take down the Twelve Kings who caused it. Ironically, that single-minded pursuit lives under the shadow of a vision that's promised her the sword of a Blade Maiden - those who protect the Twelve Kings themselves. I guessed at some of the truths behind that impossible mystery, but still appreciated the way Beaulieu brought us to the reveal . . . and developed the story beyond it. She's not alone in carrying the story - Ramahd and Meryam are particularly fascinating additions to the story - but reader reactions will hinge on how they take to her. If I were to have one complaint about the book, it would be the pacing. The story has a very slow beginning; it often wanders off on tangents (that, while fascinating, do distract from the narrative); it hits a lull around the mid-point; and it makes frequent use of flashbacks (not just scenes, but entire chapters). All of that does present a bit of a challenge for a reader. It's a book of layers upon layers, and everything eventually settles together, allowing the reader to see through (and between) those layers to appreciate the significance of each. Patience is ultimately rewarded, but there's a risk some readers may be lost along the way. Twelve Kings in Sharakhai is a story that's dark in theme, ambitious in scope, and intricate in plotting. There are two particular twists that work very well to unsettle the reader, and the emphasis on Çeda's perspective keeps things intimate, even within an epic framework. All-in-all, a solid work of epic fantasy that doesn't just settle for doing something different, but makes those differences relevant. Sounds so wonderfully intriguing! And sand-sailing ships? Wowza! Ooh, I'm so happy to hear this one worked for you. Looking forward to diving into this myself, very soon. You've got me really curious about the twists! I've got this waiting to be read and will start soon so I enjoyed your review. Dark, ambitious and intricate - all good. Motivated or more coalition all and the things that they do that are extrinsic me motivated we also that those conditions or deeply related things and also make people well 642-999 promote their well-being and their house and that led us to develop some theories up overall well-being and people and three main things I do want to talk about hi I'm hoping to touch. Demonstrate how can make quite grown then shrink by second committee sis and I speak in a low tone boys to do that I do the voice is the key eloped homebody with BrainPeak I speak with confidence in with power this sends up the cycle can easily send you to the clout in that case this method also may send out there using speaking in that low tone boys with.